In poker, to 'call the clock' means to challenge a player for taking too long to act. Once challenged, a player has a set amount of time to make a decision. If the player fails to act in the allotted time, their hand is dead. A dead hand due to someone calling the clock is like a mucked hand. The hand goes into the muck and ceases to matter. The player who held it automatically loses the hand and everything contributed to the pot up until that point. Calling the clock is rare in private games. 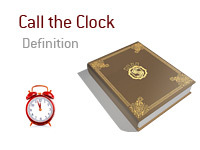 In casino and tournaments environments, a player, dealer or floor manager may call the clock. The manager enforces it, and the allotted time is often arbitrary, not predetermined. Generally, poker is not a game well suited to time limits. Each hand is different, and players need varied amounts of time to make decisions and bluff properly. Tournaments, however, must often cater to a large group of players. In high-profile events, such as the WSOP, calling the clock is rare. An example of it is the 2008 WOSP when Ramzi Jelassi called the clock on Phil Hellmuth. The round before, Hellmuth had called for it on her but quickly withdrew.